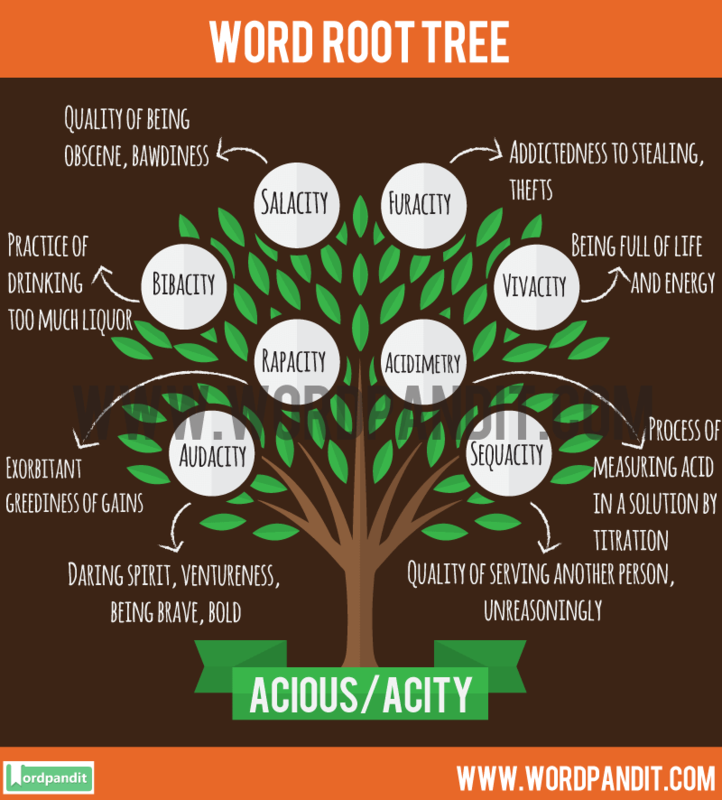 What does Acious /Acity Root Word mean? Loqu: Meaning acetyl group in chemicals. Acious: Meaning having the ability to do something or inclined to do something. loquacious: tending to talk a great deal. Her friend is loquacious, though she has veracity in whatever she speaks. 1. Perspicacious : Having the ability to see perspective, in other words clear-sighted. 2. Inefficacious : Ineffective, not being able to produce the desired result. 3. Contumacious : Rebellious or insubordinate. 4. Pertinacious : Resolute in purpose or belief. 5. Fallacious : Deceptive or misleading. 6. Mendacious : Telling lies, someone who is dishonest. 8. Predacious : Preying on others. 10. Salacity : Quality of being obscene, bawdiness. 11. Furacity : Addictedness to stealing, thefts. 12. Bibacity : Practice of drinking too much liquor. 13. Sequacity : Quality of serving another person, unreasoningly. 14. Audacity : Daring spirit, ventureness, being brave, bold. 15. Rapacity : Exorbitant greediness of gains. 16. Vivacity : Being full of life and energy. 17. Emacity : Fondness of buying stuff.